It’s not often that we planners get to see a plan being delivered on the ground – not, I hope, because they are undeliverable, but because it can take years for proposals to come to fruition. So it was with great delight that I headed up to Crianlarich last week to the opening of their new community path network, at the kind of invitation of Strathfillan Community Development Trust, who have done much good work in Crianlarich and Tyndrum over the years. The opening of the path network was a major landmark for the village. The proposal was included as a major initiative in the Community Action Plan that we prepared in 2011 (you can read more about that in my post from 2011). That plan, like so many others, was borne out of a desire by the local community to establish its priorities for the future in the face of adversity – in this case a new bypass. This small community of around 200 residents has done a magnificent job. The path network is a wonderful resource for locals and visitors alike, and shows the best of what the village has to offer – wonderful views of the village, the strath and the mountains, and a delightful riverside path that’s a real gem. With the new signposts and information panels in place, it’s a worthy stop whether you’ve got 5 minutes to stretch your legs or an hour for a longer walk. Put this together with other community initiatives – particularly the lease of the old station yard from the local authority to create a picnic area in the heart of the village – and the effect is truly transformational. As the chair of the Development Trust and local shopkeeper Isla Craig says, the transformation isn’t just physical: now that there are visible changes on the ground, more and more villagers are coming up to her and asking how they can get involved. But it’s taken 5 years of hard work by Isla and a small number of similarly committed volunteers to reach that tipping point. Similarly, when the Trust announced to the National Park and Council back in 2011 what they were going to do to improve their lot, without waiting for the public sector, that opened the door to funding and support. Wouldn’t you prefer to support an active, positive community rather than one which complains and criticises? Mind you, it’s not been an easy ride for the good folk of Crianlarich. The £200k path network has taken 5 years of hard grind from Isla and her fellow volunteers. The paths would never have happened without the support of Forestry Commission Scotland and the Big Lottery Fund but, as Isla points out, it’s not an easy process. Crianlarich is an inspiration for other communities who are thinking of putting the Community Empowerment Act into action. 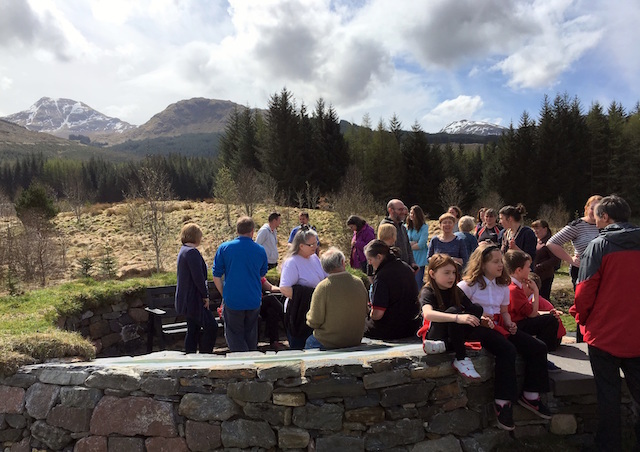 Everybody involved should be justifiably proud of the transformation that they’re delivering in Crianlarich. But remember – behind those smiling faces last Friday was a lot of hard volunteer work. So, the more that ‘professionals’ like me and the public sector can ease that burden, the more smiling faces we’ll see in communities across Scotland.